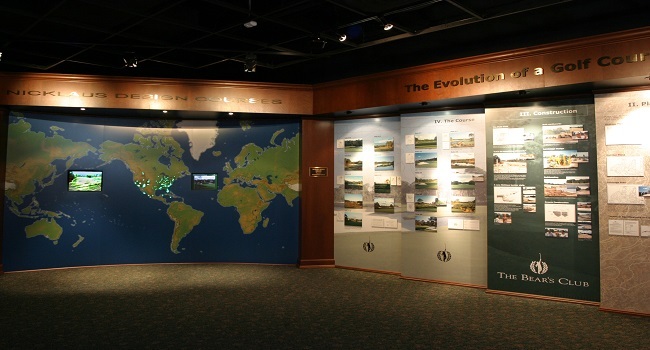 collections of golf memorabilia in the world. 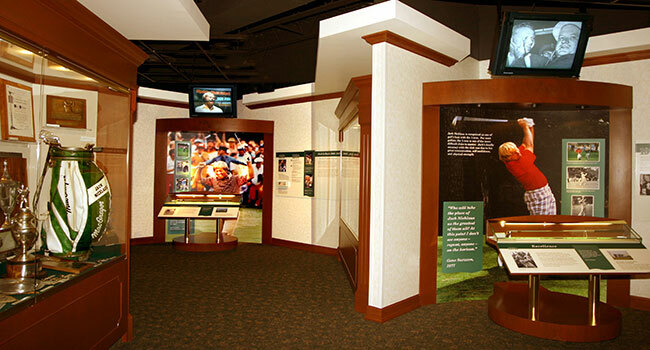 The Jack Nicklaus Museum, located in the heart of The Ohio State University sports complex in Jack's hometown of Columbus, Ohio, is a 12,000 square-foot educational and historical facility. Here, you will encounter the history of golf and its greatest practitioner…take an immersive journey through Jack's brilliant career including trophies, photographs and various mementos from his unparalleled 18 major championships and 100 worldwide professional victories…and discover the many facets of this remarkable man who added so much to the history of golf. Your visit will bring to life the story of a man who transcended the game. Jack Nicklaus' total commitment and mental toughness define greatness not only in golf and in sport, but also in life. Explore the origins of the sport from the 1400s in Scotland and learn of the great traditions of the game. Encounter golfing greats such as Jones, Snead, Zaharias, Hogan, Palmer, and others who helped build the sport. Here you can also trace the development of golf equipment from the feather ball era of wooden clubs, to the gutta-percha ball and iron "cleeks", to the wound ball and classic irons and woods. Learn about the life of Jack Nicklaus through the years. Each decade is represented: his boyhood days in the 1940s, learning the game in the 1950s, challenge for the top spot in golf in the 1960s, dominance of the sport in the 1970s, amazing comebacks in the 1980s, Champions Tour excellence and course design career accolades of the 1990s, and the legendary status he enjoys in the 21st century. 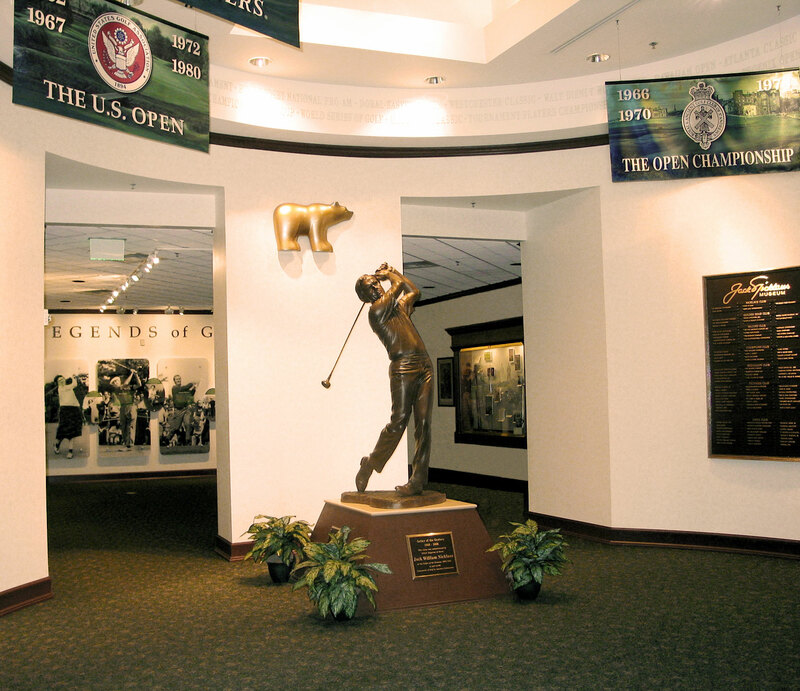 An extraordinary collection of Nicklaus artifacts is on display - the clubs, trophies, awards, scorecards, golf bags, golf balls, and mementos collected through over 50 years in the sport. A highlight is Jack's legendary George Low Sportsman putter. 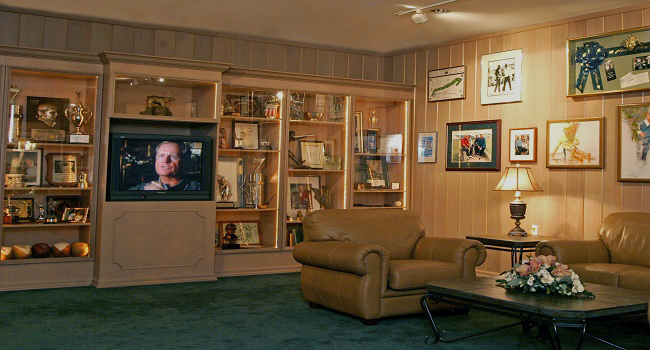 The story of Nicklaus' unprecedented 18 major championships and the history of the majors is told in these galleries. Here you will find a record 6 Masters trophies and a Masters green jacket, along with such important golf clubs as Jack's 1967 U.S. Open-winning putter "White Fang", his 1986 Masters irons, his 1959 & 1961 U.S. Amateur wood-shafted putter, and his 1973 PGA Championship wedge. 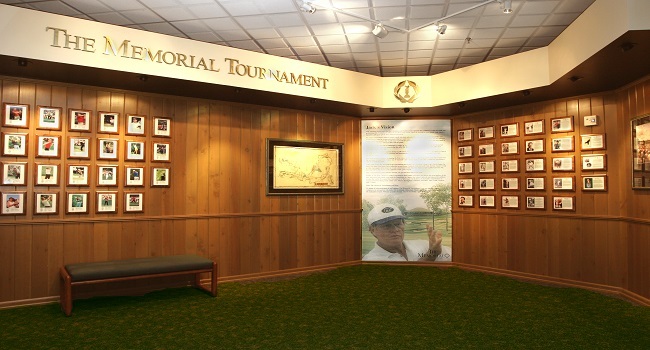 Each of the 5 galleries recreates the environment of each major, complete with venue wall murals and clubhouse doorways. Family life has been the most important part of Jack Nicklaus' career. Nicklaus has said that his family was one of the keys to his success in golf. 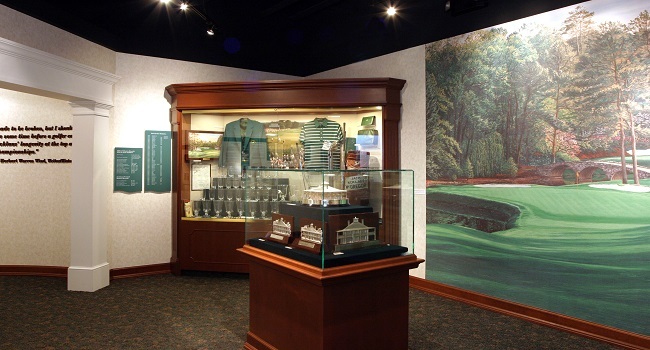 This gallery gives guests the experience of visiting the Nicklaus home in Florida. On exhibit are photos and family mementos displayed as in their actual family room. Featured is a video production hosted by Jack Nicklaus II providing a unique look at their family life growing up in the Nicklaus household and living as a golf tour family. The Memorial Tournament is a dream come true for Jack Nicklaus. 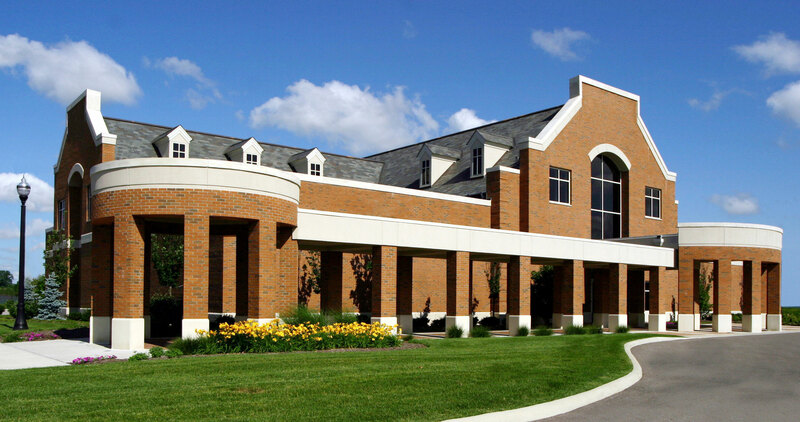 In 1974 Muirfield Village Golf Club opened, and the first Memorial Tournament was held in 1976, soon becoming one of the most prestigious stops on the PGA Tour. Artifacts from the tournament over the years are on display, such as Greg Norman's mud-covered golf shoes from the final round of his 1995 victory. There are also tributes to its Illustrious champions and yearly honorees. Golf course design has become Jack Nicklaus' "second career" and another lasting Nicklaus legacy to golf. He began in the late 60's as a consultant on Hilton Head's Harbour Town Golf Links with Pete Dye, and now has designed over 410 courses worldwide. This gallery shows the locations of these courses on a wall-sized map and illustrates how a course is designed from start to finish. Characteristically, Nicklaus' courses continue his commitment to quality and attention to detail. 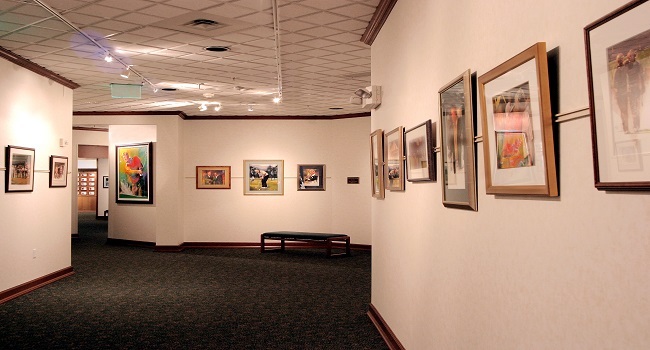 On display is a collection of original Nicklaus paintings by noted golf artist Glenn Harrington. These striking images are a pictorial essay of Nicklaus' Career and his family through the years. 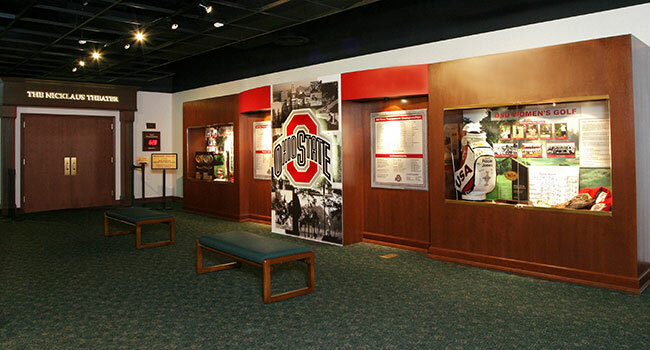 The Ohio State University, host campus of Museum and Nicklaus' alma mater, has over a 100-year history of competitive golf. The Men's & Women's golf teams have a proud tradition of excellence with many former players making their mark on their professional tours. Trophies from Big Ten and NCAA national championships are on display, along with golf equipment and a collection of signed golf balls. The OSU Turf Grass Science program has also made a big impact on the national scene, with many graduates working at the foremost golf courses, ballparks, and stadiums around the country. The unique discipline of turf grass science is clearly presented. A three-screen presentation on Jack’s life and career narrated by Sean Connery. The theater is also available for meetings and events. Jack won 10 of the first 35 official starts on the Champions Tour, eight of which were senior majors. He has finished in the top 25 in 57 of his 68 senior starts and has 38 top-10 finishes, as of January 2002.
carded 51 in the first nine holes he ever played... won the Scioto Club Juvenile Trophy. won the Scioto Club Juvenile Trophy for a second time. won the Ohio State Junior Championship to launch a consecutive streak of five straight wins (1952 to 1956 inclusive). played in his first national tournament (U.S.G.A. 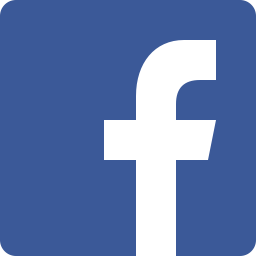 Junior Championship for ages 17 and under) and captured first three matches before being eliminated. Won the Columbus Junior Match-Play Championship and Ohio State Junior title. won the Columbus Junior Championship in both the stroke-play and match-play competitions as well as the Ohio State Junior crown. again claimed both Columbus Junior Championships along with Columbus District Amateur title...for the first time, qualified for the U.S. Amateur, losing in first round, 1-down...won Ohio Jaycees and Ohio State Junior again. among most notable victories during these early years was the Ohio State Open, which featured a strong field in 72-hole stroke-play. He won easily on two-round final day with scores of 64 and 72 ... again won the Ohio State Junior title and Ohio Jaycees, but lost the U.S. National Jaycees Championship in playoff. won his first national title by capturing the U.S. National Jaycees Championship. Qualified for the first time at the U.S. Open and missed cut. won Trans-Mississippi Championship...qualified again for U.S. Open, this time making the cut and finishing in tie for 41st place; playing in first PGA tour event (Rubber City Open at Akron's Firestone), was one stroke back of lead at halfway point with rounds of 67 and 66 and finished 76-68 for 12th spot. aptured 1959 U.S. Amateur, defeating Charles Coe, 1-up, in 36-hole final at Broadmoor, Colorado Springs ... also played on winning Walker Cup squad against Britain at Muirfield, Scotland ... won North-South and Trans-Mississippi championships ... reached quarterfinal at British Amateur. runner-up to Arnold Palmer in U.S. Open by two strokes at Cherry Hills and established a record 282 for an amateur entry ... emerged individual winner in World Amateur Team Championship by 13 strokes with 269, eclipsing Ben Hogan's record by 18 shots at Merion Golf Club, where Hogan had finished Open with 287...Colonial Amateur Champion. in last year as amateur, won U.S. Amateur a second time, defeating Dudley Wysong, 8 and 6, at Pebble Beach, California...member of winning Walker Cup squad; Western Amateur Champion, NCAA and Big Ten Champion; finished tied for fourth at U.S. Open. Honors 1985 Golf Family of the Year presented by National Golf Foundation; 1992 Family of the Year presented by the Metropolitan Golf Writers Association; 1999 Father of the Year Award presented by Minority Golf Association of America. Barbara 1998 First Lady of Golf Award presented by PGA of America (inaugural winner); 2000 Winnie Palmer Award presented by Metropolitan Golf Writers Association (inaugural winner). 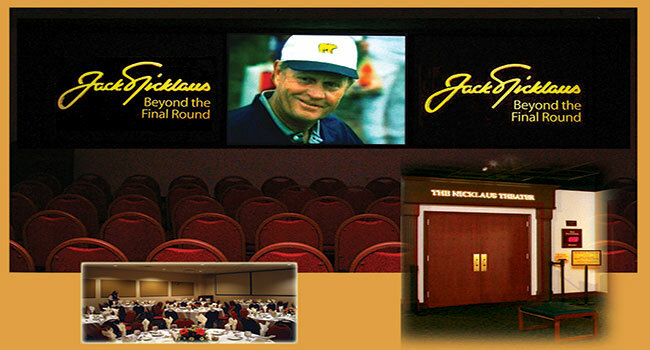 The Jack Nicklaus Museum is the perfect place to host an event that your guests will be sure to remember. Whether a formal dinner party, corporate board meeting, or 200-person reception, the Jack Nicklaus Museum can accommodate your event. 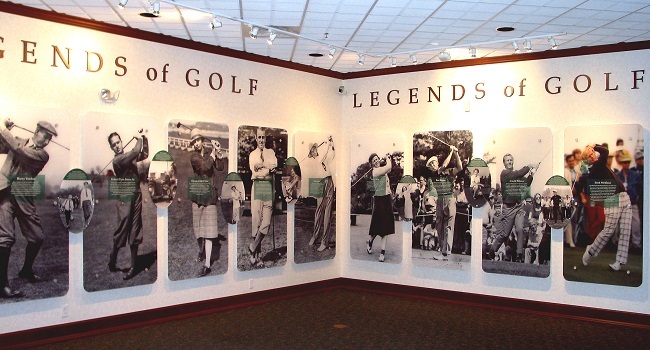 Please contact the museum for details about hosting your next event in a museum dedicated to the Golfer of the Century!